Asthma is a chronic inflammatory disorder of the airways that is characterized by airflow obstruction, bronchial hyper-responsiveness, and underlying inflammatory changes. It is estimated that 300 million people are affected with asthma worldwide. In Saudi Arabia, it is considered one of the common diseases, and almost 2 million patients are affected with a prevalence of approximately 20-25%. Guidelines for asthma management, such as the Global Initiative for Asthma, were introduced to reduce asthma-associated mortality and morbidity by improving patient care and providing optimal asthma control. According to the guidelines, the goal of asthma control is to prevent acute exacerbations and to minimize the symptoms of asthma (including night symptoms), use of bronchodilators, and limitations in activities. Bronchial asthma is a major public health problem that negatively impacts patients, their families, and the community by inducing work and school loss, a poor quality of life, frequent emergency visits, hospitalizations, and death. , Large proportion of asthma direct and indirect asthma cost is due to severe and uncontrolled asthma. Because the healthcare system differs in each country, the relative importance of factors that may contribute to asthma control is variable. There are no studies about factors associated with poor asthma control among Saudi patients. Therefore, studying and understanding these factors within the country can help in developing a local approach to control these factors and to decrease the burden and morbidity of the disease. This study was undertaken to explore the factors that can affect asthma control in the outpatient clinic at primary care sitting and to measure the percentage of uncontrolled asthma, using the ACT, among participants. This cross-sectional study was conducted at the King Abdulaziz Medical City-King Fahad National Guard Hospital in Riyadh outpatient clinics at community care clinics. We recruited all adult patients (more than 18 years old), who had a documented diagnosis of bronchial asthma (BA) by their primary treating physician and on asthma inhalers were. The following exclusion criteria were employed: Co-morbidity with similar presentation to BA (congestive heart failure, chronic obstructive pulmonary disease, and bronchiectasis), diagnosis of asthma less than 4 weeks, and undocumented diagnosis of asthma. The study was approved by the local institutional review board (Ref. RR11/138). The data were collected and analyzed using statistical package of social sciences (SPSS) version 21. Descriptive statistics, such as means and standard deviation, were used to summarize age, BMI, and the duration of BA. Counts and percentages were used to summarize gender, education, inhaler used, follow-ups in the clinic, education about asthma, education about therapy, and the patient's knowledge of environmental triggers. We used independent t-test to test whether the sources of asthma education effects patients' knowledge about asthma. Demographic and clinical variables were compared in each group, according to the ACT scores and using the Chi-square test. Independent t-tests were used to compare other demographic and clinical data, such as age, BMI, and the duration of BA in patients with uncontrolled asthma and partially/fully controlled asthma. The Mann-Whitney U test was used to analyze quantitative data when the variable was not normally distributed. We enrolled 400 asthma patients in the study. Among these patients, 280 (70%) were women. The patients' demographic and clinical characteristics are shown in [Table 1]. The mean age was 45.6 ± 16.2 years, and the mean duration of asthma was 9.5 ± 4.0 years. The mean BMI was 31.5 + 7.5 kg/m 2 . Approximately half of the patients had received a high school education or less, 38.9% had no education, and only 12% had university education. Uncontrolled asthma using ACT documented in 39.8%. There were 324 (81.4%) patients with regular physician follow-ups, whereas 74 (18.6%) patients did not have regular follow-ups. Approximately one-third (33.8%) of the asthmatic patients had reported ED visits. Improper use of inhaler devices documented in 53.8% of patients. The majority of patients received formal education about asthma (339; 84.8%) and asthma therapy (347; 87.0%). 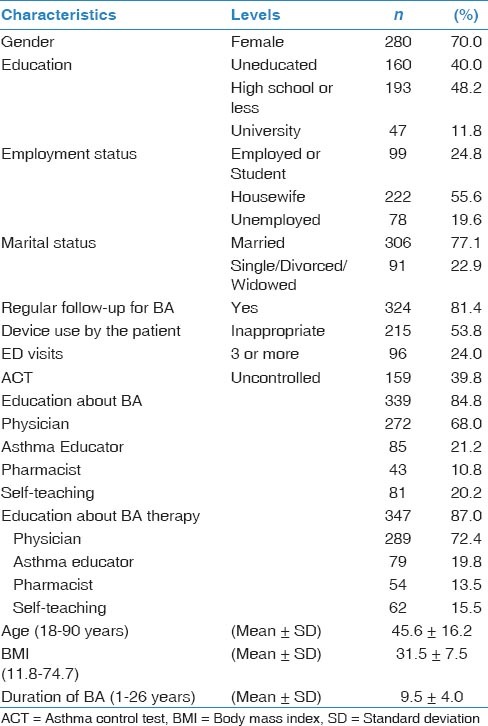 Of the 339 patients who received information about asthma, 68% received formal education from physicians, 21.2% received education from asthma educators, and 10.8% received education from pharmacists. [Table 2] demonstrates the patients' knowledge of asthma and environmental factors that may trigger the disease. Two hundred and twenty-four (56.0%) patients were not aware that active smoking could trigger asthma, and the majority of participants (93.5%) reported that passive smoking was not a trigger of asthma. Most patients did not know that the bedroom carpet, unsealed mattress, or workplace triggers could trigger asthma (87.8%, 88%, and 71.2%, respectively). A significantly large number of patients (79.5%) reported that they stopped asthma therapy once they felt better, whereas 62.2% of patients increased or initiated steroid therapy when the attack was perceived. Furthermore, 368 (92.0%) patients said that they increased or started bronchodilator therapy once the attack was perceived. Only 2.5% of patients did not know what triggered their asthma. Almost half of the patients (50.8%) reported that they had prospectively discussed asthma management with their physician, and 72.8% of patients had discussed the asthma action plan. One hundred and forty-nine (37.2%) patients felt that asthma therapy was not safe for long-term use, and 138 (34.5%) patients believed that therapy was addictive [Table 2]. The relationship between the sources of asthma education and knowledge about bronchial asthma disease are illustrated in [Table 3]. 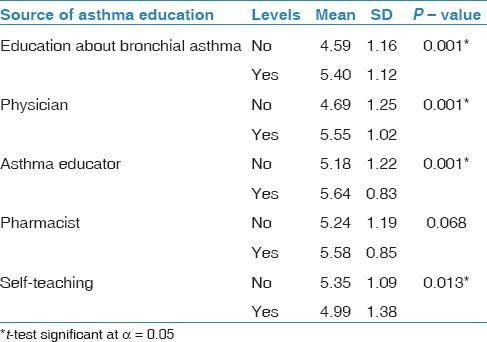 More knowledge about asthma was observed in patients with education about bronchial asthma compared to those with no education (5.40 ± 1.12 vs. 4.59 ± 1.16, P 0− value = 0.001). Physician (P − value = 0.001) and Asthma Educator (P 0− value = 0.001) effects patients' knowledge about asthma positively, while self-education about asthma (P − value = 0.013) effects patients' knowledge about asthma negatively. Pharmacist had no effects on patients' knowledge about asthma (P − value = 0.068). Uncontrolled asthma was defined as an ACT score ≤16. The relationship between the patients' demographic or clinical characteristics and uncontrolled asthma are shown in [Table 4]. There was a significant relationship between Female gender and uncontrolled asthma (P - value =0.002). Unemployment was significantly associated with uncontrolled asthma (P − value = 0.019). In addition, uncontrolled asthma was more common in single or widowed patients (28.7%, P − value = 0.028). Improper device use by the patient was more frequently associated with uncontrolled asthma (46.9% partially/fully controlled vs. 64.2% uncontrolled asthma, P − value = 0.001). Active smoking (P − value = 0.007), passive smoking (P − value = 0.019), unsealed mattress (P − value = 0.030), and workplace triggers (P − value = 0.036) were also associated with uncontrolled asthma. However, the extent of asthma control did not appear to be related to existence of regular follow-ups, bedroom carpets, outpatient clinic visits, age, BMI, or duration of asthma. A major strength of this study lies in its direct interviewing of the patients and the confirmation of obtained information by reviewing medical records. The major limitation of our study is a single-center study and probably will not reflect national asthma care and control as the level of care is diverse across the country. Also we did not report the compliance because it was based on the patient report which was not reliable. Also this study did not address the quality of education given to the patients about asthma. Similar to previous study, this study showed that many asthmatic patients have misconceptions about asthma and its treatments. Also many factors contributing to uncontrolled asthma, these factors can be easily overcome by placing an emphasis on regular patient education, specifically regarding the role of inhalers in asthma treatment. The current study demonstrated the ineffectiveness of self-education in patients' knowledge about asthma. This study was not designed to assess the quality of education given to the asthmatic patients by health educator, however, this study provided that asthma education given to the patient is of questionable quality in improving asthma control. We speculate that improving communication with clear patient education and instruction of how to use inhaler devices on a regular basis and to know the asthma triggers and how to avoid them will improve asthma control. In conclusion, the present study confirmed the high prevalence of uncontrolled asthma in the community outpatient clinic setting and identified risk factors that can contribute to poor asthma control. This studies also provided that asthma education given to the patient by health care provider is of questionable quality in improving asthma control and the need for structured asthma educational program. We thank King Abdullah International Medical Research Center for their financial support. GINA. Global strategy for asthma management and prevention (GINA) of asthma. [Last accessed on 2013 Mar 21]. Soriano JB, Rabe KF, Vermeire PA. Predictors of poor asthma control in European adults. J Asthma 2003;40:803-13. NIH. National Asthma Education and Prevention Program. Expert Panel Report 3: Guidelines for the Diagnosis and Management of Asthma. Bethesda (MD): National Heart, Lung, and Blood Institute. NIH Publication No. 07-4051. NIH Publication No 07-4051. 2007. Stewart WF, Ricci JA, Chee E, Morganstein D. Lost productive work time costs from health conditions in the United States: Results from the American Productivity Audit. J Occup Environ Med 2003;45:1234-46. Buist AS, Vollmer WM. Reflections on the rise in asthma morbidity and mortality. JAMA 1990;264:1719-20. Marcus P, Arnold RJ, Ekins S, Sacco P, Massanari M, Stanley Young S, et al. CHARIOT Study Investigators. A retrospective randomized study of asthma control in the US: Results of the CHARIOT study. Curr Med Res Opin 2008;24:3443-52. Mintz M, Gilsenan AW, Bui CL, Ziemiecki R, Stanford RH, Lincourt W, et al. 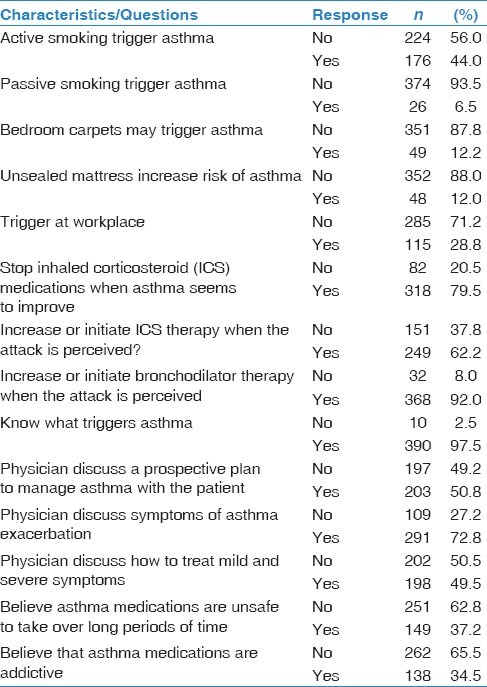 Assessment of asthma control in primary care. Curr Med Res Opin 2009;25:2523-31. Haughney J, Barnes G, Partridge M, Cleland J. The Living and Breathing Study: A study of patients' views of asthma and its treatment. Prim Care Respir J 2004;13:28-35. Horne R, Price D, Cleland J, Costa R, Covey D, Gruffydd-Jones K, et al. Can asthma control be improved by understanding the patient's perspective? BMC Pulm Med 2007;7:8. Holgate ST, Price D, Valovirta E. Asthma out of control? A structured review of recent patient surveys. BMC Pulm Med 2006;6:S2. Chipps BE, Spahn JD. What are the determinates of asthma control? J Asthma 2006;43:567-72.
de Vries MP, van den Bemt L, Lince S, Muris JW, Thoonen BP, van Schayck CP. Factors associated with asthma control. J Asthma 2005;42:659-65. Herjavecz I, Nagy GB, Gyurkovits K, Magyar P, Dobos K, Nagy L, et al. Cost, morbidity, and control of asthma in Hungary: The Hunair Study. J Asthma 2003;40:673-81. Stanford RH, Gilsenan AW, Ziemiecki R, Zhou X, Lincourt WR, Ortega H. Predictors of uncontrolled asthma in adult and pediatric patients: Analysis of the Asthma Control Characteristics and Prevalence Survey Studies (ACCESS). J Asthma 2010;47:257-62. Dalcin PT, Menegotto DM, Zanonato A, Franciscatto L, Soliman F, Figueiredo M, et al. Factors associated with uncontrolled asthma in Porto Alegre, Brazil. Braz J Med Biol Res 2009;42:1097-103. Al-Jahdali HH, Al-Zahrani AI, Al-Otaibi ST, Hassan IS, Al-Moamary MS, Al-Duhaim AS, et al. Perception of the role of inhaled corticosteroids and factors affecting compliance among asthmatic adult patients. Saudi Med J 2007;28:569-73. Ahmed AE, Al-Jahdali H, Al-Harbi A, Khan M, Ali Y, Al Shimemeri A, et al. Factors associated with poor asthma control among asthmatic patient visiting emergency department. Clin Respir J 2014;8:431-6.